The need to get natural enemies of pests into arable crops, and developing methods to achieve this, is not a new idea. It has long been acknowledged as a limiting factor to achieving effective pest control, not just at crop edges but into the centre of large fields. The first incarnation of this idea was beetle banks, which are raised strips sown with tussocky and other types of grasses. They were principally designed to ensure there were large populations of ground beetles. While these are great for this specific goal, the ideal now is to build on this to promote better pest control through boosting populations of beneficial insects, but to have something that fits in well with modern farming systems. This is something the ASSIST programme (Achieving Sustainable Agricultural Systems) has now begun to trial on a large scale in the UK. Scientists are sowing flower strips in the crop on a number of commercial farms and testing the results over the next five years. The concept being tested in the UK builds on work undertaken in Switzerland by researchers Matthias Albrecht and Matthias Tschumi. 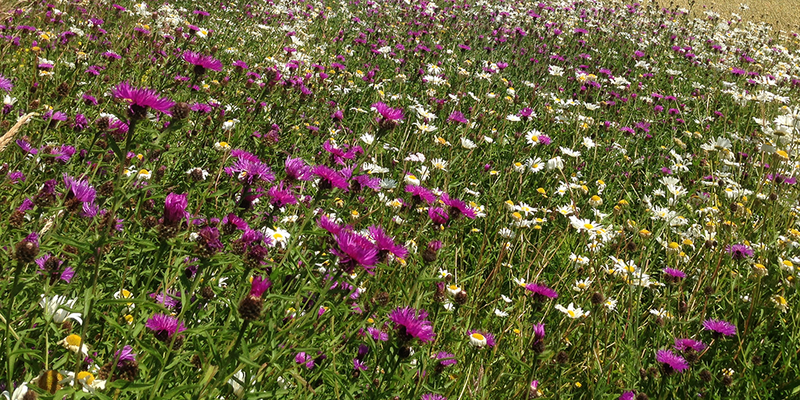 In-field wild flower strips move beyond beetle banks in a number of important ways. Perhaps the most important is that their focus is on supporting diverse communities of predatory and parasitic insects that kill pests. Research increasingly suggests that complex communities of predators and parasitoids are the most effective at controlling pests. Rather than just promoting predominantly ground active predators, we need to support those in the canopy or those that target internal pests living in stems or seed pods. By sowing specific grasses and wildflowers we can target the resources provided by in-field strips and normal field margins to benefit the greatest diversity of important predators. For example many parasitic wasps need access to open flowers so that they can feed on pollen and nectar. Without this resource the number of eggs they can lay is dramatically reduced, and with it pest control. The in-field flower strips are also designed to provide early season pollen and nectar resources for important crop pollinators, such as bumblebees and solitary bees. In this respect they should provide dual benefits – enhanced natural pest control and crop pollination. The in-field flower strips were a practical solution that was co-designed with the farming industry. Another advantage of in-field strips as opposed to beetle banks is the absence of a raised bank. This means these strips are easy to manage by cutting and can be readily re-established in another field if required. This flexibility in some ways is increasingly more viable with modem precision agriculture, with GPS-linked farm machinery allowing the exact location of these strips to be known, reducing the chances of accidental spraying. In the past, having raised banks was the more practical way of making these features obvious. As with much of applied agriculture each idea is building on the last, integrating management innovation being driven by farmers and agronomists with new scientific research. The NERC and BBSRC-funded ASSIST programme is aiming to deliver such research with support from farming and industry. See the ASSIST project website for more detail on some of the work packages. ASSIST is a five-year+ £11m research investment by NERC and BBSRC. The Centre for Ecology & Hydrology in partnership with Rothamsted Research and the British Geological Survey is working with a number of collaborators to deliver the programme.